This was a hard one because i have so many good memories, i swear every weekend is amazing, but this has to top it off. 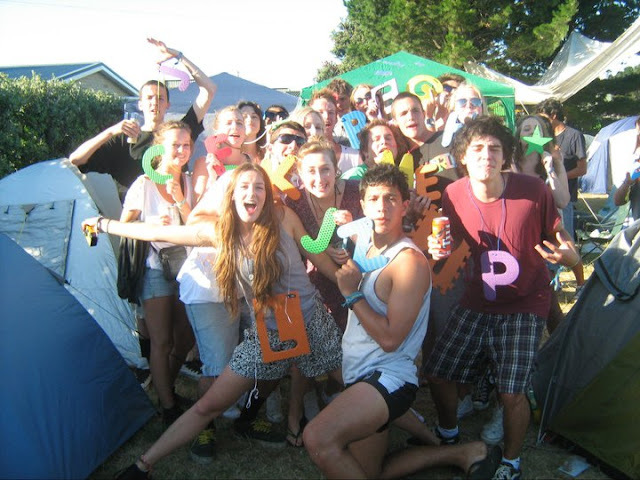 This is from Rhythm and Vines 2010/2011, best week of my life, hands down. So basically everyone camps and then heads of to a music festival each night which is in a vineyard. I think its about the third thing to do for new years, after i think Rio and maybe Thailand? Anyway this is my group of friends, about 30 of us all up, and the letters we all have are the first letter of our name. Such a good idea, when you got lost you just text someone saying "letters up" (or "lettuces" was also a good one), and everyone would hold up there letters, not only was it helpful, everyone else loved it too, trying to figure out what we were spelling when it was actually just letters. We got the letters from one of those kids mats, ive still got mine hanging in my room. Anyway, had the best week ever and can't wait to go back this year and make it even better!